After a long wait, a customer happily receives her matcha-ube soft-serve swirled into fish-shaped waffle cone. 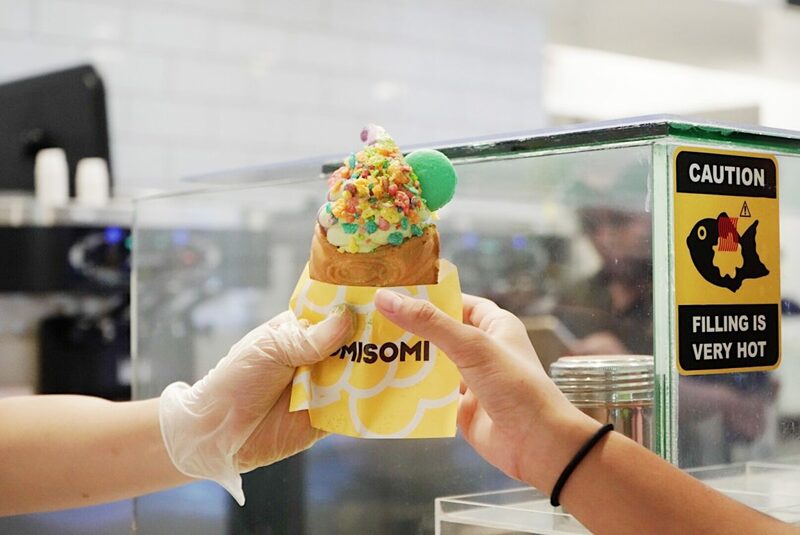 On October 20, 2018, SomiSomi, a Californian dessert chain, made its way to Ala Moana Shopping Center. Unlike regular ice cream chains, SomiSomi has more to offer than just ice cream. They are known for their unique, Korean-inspired soft-serve flavors, an abundance of sweet toppings, and the Ah-Boong. 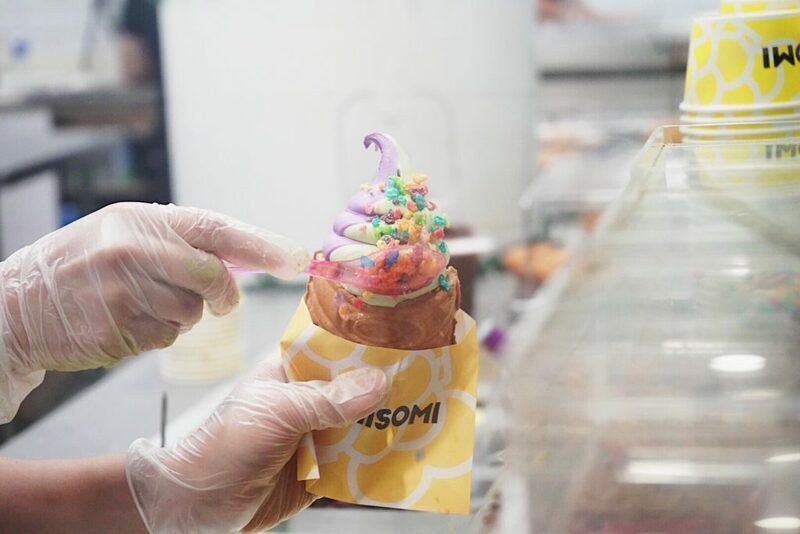 Much like Japan’s taiyaki dessert, the Ah-Boong is SomiSomi’s signature offering, a crispy, yet slightly chewy “Gold Fish shaped waffle cone” stuffed with a sweet or savory filling, and then topped with soft-serve ice cream and other toppings. SomiSomi allows you to customize your cool snack in three simple steps: First, choose your flavor. They offer flavors such as matcha, oreo, ube, and cream. If you’re the type who has a difficult time choosing between flavors, you can pick “this week’s swirl,” which allows you to choose between two sets of swirled flavors. Second, fill your taiyaki (or waffle cone.) With several fillings to choose from—cheddar, red bean, taro, Nutella, or custard—these sweet and savory flavors will satisfy most customers’ cravings. Third, add your toppings. From black sesame to sugary cereal, SomiSomi has at least eight different topping options. You can also choose to enjoy your dessert in a cup or have your taiyaki filled with just ice cream. Also, if you’re not in the mood for ice cream, you’re more than welcome to order just the taikyaki or the Ah-Boong, or just the ice cream. The cups go for $3.75, and for just $2.20 more, the Ah-Boong is $5.95. A SomiSomi employee tops off an Ah-Boong matcha-ube swirl with Fruity Pebbles. I ordered the cream and oreo swirl Ah-Boong with a taro filling, sprinkled with black sesame and fruity pebbles. (Total cost: $5.95) I have to admit, the Ah-Boong was not what I was expecting at all. Prior to taking a bite of the golden fish, I thought I’d be biting into a soggy waffle, but I was taken by surprise; it was warm and crispy with a sweet and creamy taro filling. My only concerns were that the filling was a little too sweet and it slightly overpowered the ice cream. Also, the swirled flavors were also very similar in taste, making it hard distinguish which ice cream I was biting into. However, the experience of eating an Ah Boong is unique. Being that SomiSomi is a new dessert spot, not to mention the only one in Hawaii, they tend to be pretty busy. I’ve been to SomiSomi three times—during the weekend, after school, and on a holiday. All three times, the lines trailed in front of their neighbor, Jollibee’s restaurant. However, SomiSomi’s employees work quickly and my wait in line took roughly 15 to 20 minutes, which in my opinion, isn’t too bad. Like many new dessert spots, SomiSomi has started off strong, enticing and satisfying many consumers. 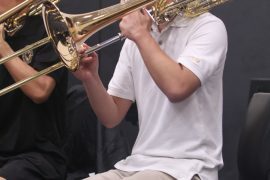 However, time will tell if SomiSomi can make it past the novelty period. 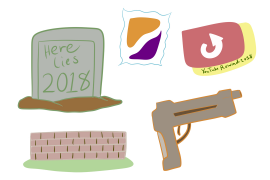 I’m not saying that Somi Somi will shut down soon; however, I believe that the hype will eventually die down. I like how SomiSomi takes a different approach to the way we eat dessert. Though the Ah Boong was mediocre, I have to agree with Jammy—their impeccable customer service made the experience worthwhile and made me want to go back again.